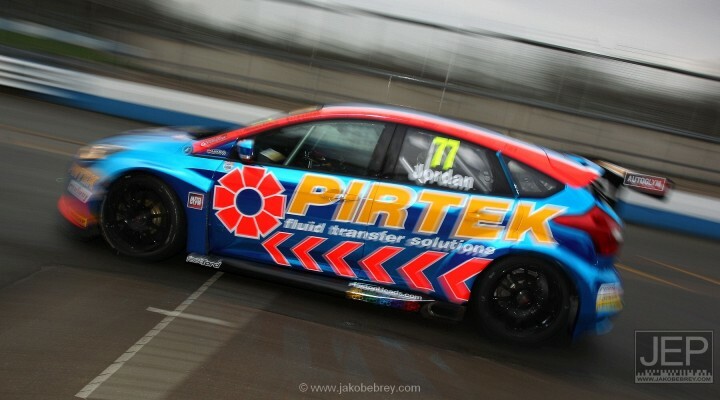 Andrew Jordan completed a faultless day of running in both dry and wet conditions as he continued his testing programme in the newly-liveried Pirtek Racing Ford Focus at Donington Park. Jordan made his bow in the Motorbase-run machine at Brands Hatch last month but yesterday marked his first outing with the car fully shod with the latest RML components. “There are always some frustrations with changing conditions but in truth it was actually good to get some wet running – we haven’t much of that in 2015. Jordan and Motorbase have an extensive testing programme planned over the winter, which bodes for a team and car that was arguably the cream of the crop in the latter half of the 2015 BTCC season. “We were able to start some fundamental sweeps through set-up changes but we have much more planned in the New Year, and particularly when we test in Portugal,” continued Jordan. “The car is easy to drive but it’s always a much bigger task to learn everything, which is obviously one of the reasons why we have such a comprehensive testing schedule ahead. “It’s a car that you feel fyou can really influence it. It’s so responsive to driver input and I drive very much on feel, so this suits me. You can hustle the car if needs be and it provides good feedback. WIX Racing and Eurotech were also in attendance at the open test day at Donington Park, and we’ll be catching up with both teams in the coming weeks.